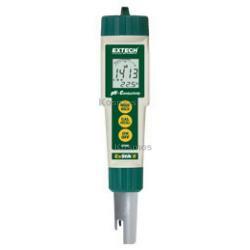 Waterproof ExStik® II pH/Conductivity Meter, Kosmos Scientific de México, S.A. de C.V. Combination flat surface pH electrode with autoranging high accuracy Conductivity cell. * Measures 5 parameters including Conductivity, TDS, Salinity, pH, and Temperature using one electrode. * 9 units of measure: pH, µS/cm, mS/cm, ppm, ppt, mg/L, g/L, °C, °F. * Analog bargraph indicates trends. * Memory stores up to 25 labeled readings. * Adjustable Conductivity to TDS ratio from 0.4 to 1.0; 0.5 fixed Salinity ratio. * RENEW feature alerts user when electrode needs replacement. * Complete with meter and electrode, protective cap, sample cup, four 3V CR-2032 batteries, and 48" (1.2m) neckstrap. * Order Conductivity standards and pH buffers separately. With the IP rating IP57 the instrument is totally protected against dust and against the effect of immersion in liquid between 15cm and 1m.